The supercomputer will support a range of AUT projects, including the international SKA project. Telecom’s ICT services division Gen-i has donated a supercomputer to AUT University that will now be used to support student learning and boost local and international research for radio astronomy. The supercomputer had at one time been leased to Weta Digital for rendering work on feature film King Kong, but became surplus to Gen-i’s requirements. “We were faced with the reality that despite still being very viable equipment, this supercomputer was no longer of use to us. “It’s always preferable that we donate rather than send equipment to be scrapped for parts, and in this case we’re absolutely delighted that this supercomputer will now be used to boost critical research projects as well as contribute to student learning,” said Tim Miles, Gen-I CEO. 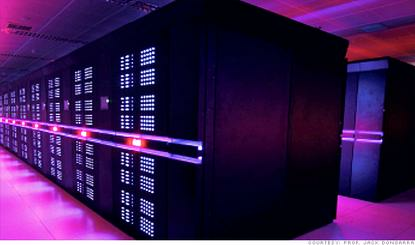 According to the company, the donated supercomputer is made up of 200 IBM HS20 Blade servers and ancillary equipment that work together to provide more than 1.4 teraflops/s of processing power and 0.8 terabytes of RAM. Most of the high-powered equipment has been moved to Warkworth, where AUT operates two radio telescopes at Telecom’s satellite earth station site. The remaining servers are located on AUT’s city campus where they will help students studying high performance computing at AUT’s school of computer and mathematical sciences. “The supercomputer opens up the opportunity for AUT’s Institute for Radio Astronomy and Space Research (IRASR) to establish a data correlation centre in Warkworth. The centre would be used to gather data from several radio telescopes undertaking the same observations simultaneously from different countries,” said Professor Sergei Gulyaev, director of IRASR. “AUT would then use the data for tectonic plate monitoring, determination of parameters of Earth rotation, investigation of physics of active galactic nuclei and quasars, and the study of cosmic masers and star formation regions in the Milky Way galaxy,” he added. AUT will use the supercomputer as the test bed for the SKA design work they’re contributing to. Specifically, it will enable the AUT team to test algorithms and prototyping for the design of the SKA Central Signal Processor and ScienceData Processor.